I made my way to Rosemont this morning and managed to avoid the rain. 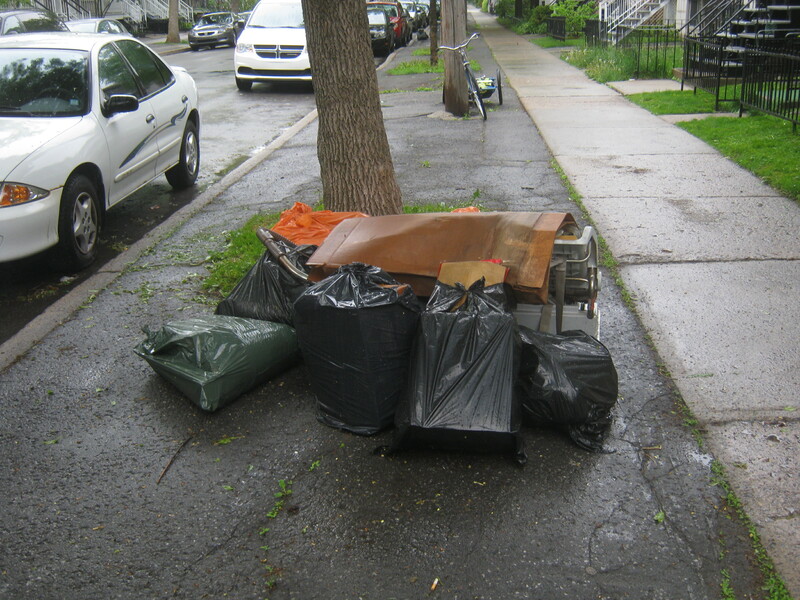 I didn’t see much interesting trash but sometimes all it takes is one spot to get a decent haul. That’s what happened today when I stumbled upon this pile of stuff that looked as if it had been stored away for a while. I pulled these boxes out of the angular-looking bag in the front. 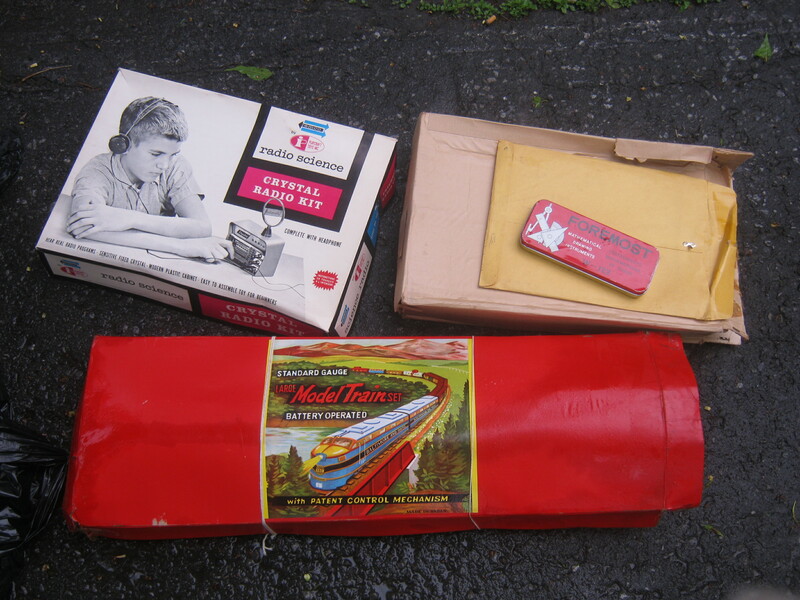 There was an old crystal radio kit that looks to be intact and an old train set. The train set box was a bit wet from the rain but the rest was well protected by the bag. The train set is pretty sweet. There are eight cars (all in great shape!) 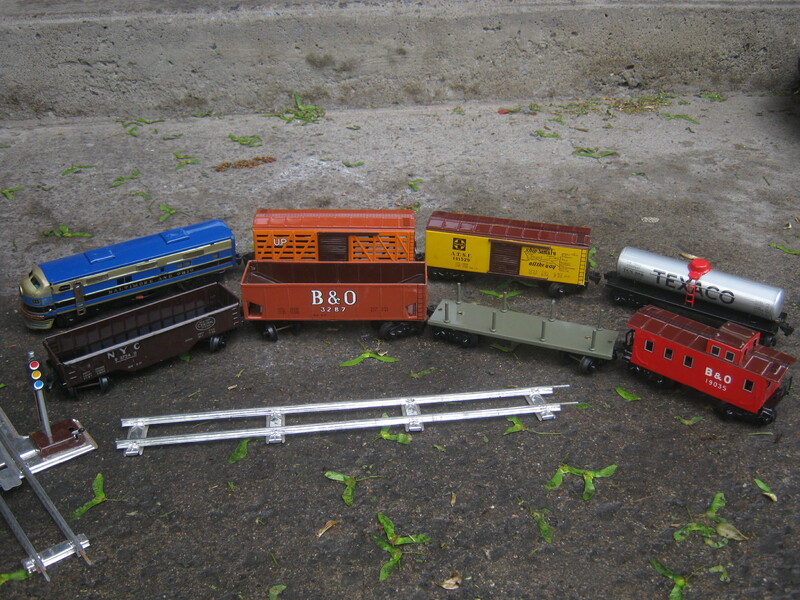 and a bunch of rails and switches. I’m going to see exactly how many pieces I have later; hopefully it’s a full set. 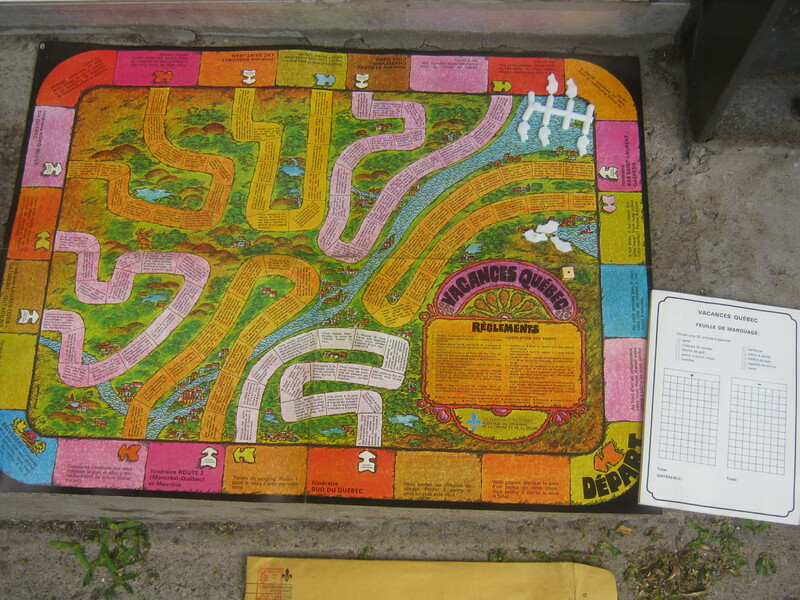 Inside the envelope was a board game designed by the tourism department of the Quebec government. It looks to be from the 60s or 70s and was made to promote Quebec’s historical landmarks. In another bag were these old pins under framed glass. 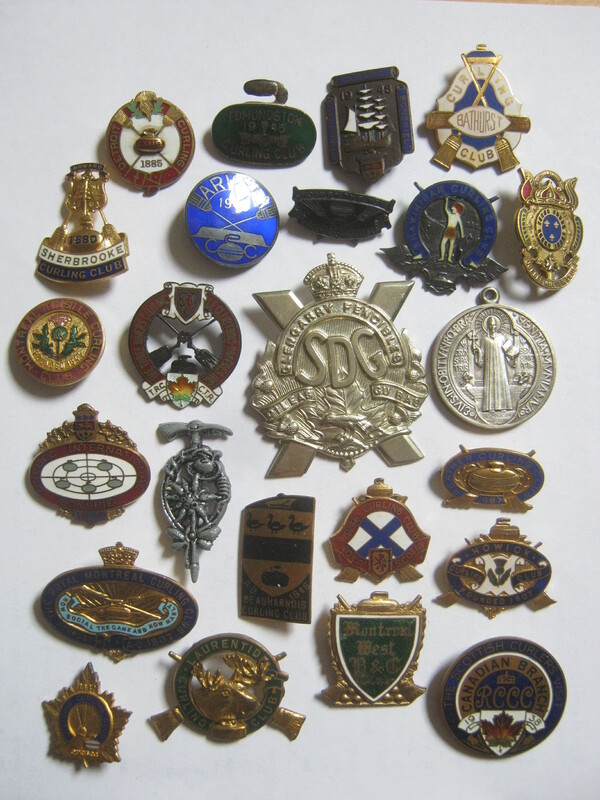 The majority of pins are from curling clubs ranging from Montreal to Nova Scotia to as far as Detroit. There are two pins from the 1948 and 1949 Quebec International Bonspiel (curling tournament) and I figure most of the other pins are from around that era. Four of the pins – from the Shawinigan, Trois-Rivieres, Arvida and St-Stephen Curling Clubs – are marked as sterling silver. 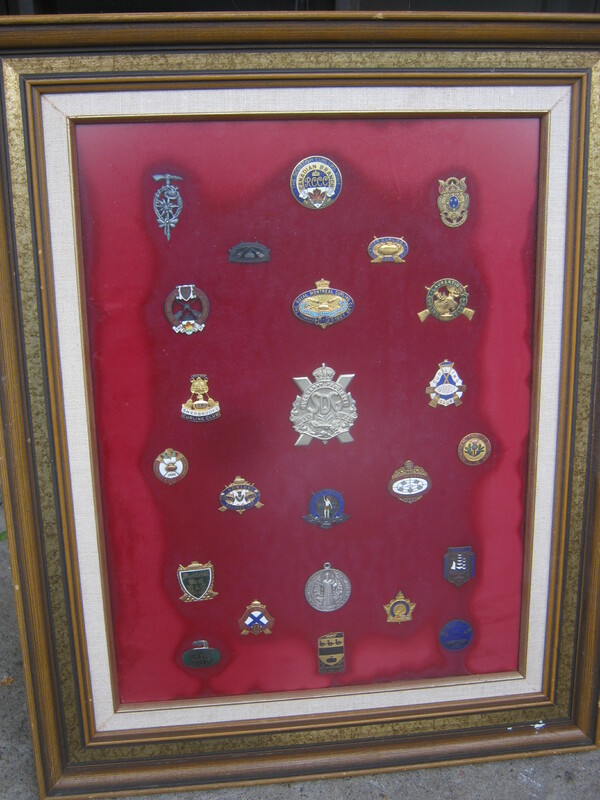 In the middle is a badge marked “Glengarry Fencibles” which I think is a WWII battle honour. Below that is a St-Benedict medal. I took these out from under the glass. Whoever put them there took off the pins and stuck a little sticky tab is their place to keep them stuck on the red velvet background. That probably decreases their monetary value somewhat but these are still really beautiful old badges in really great shape. The group picture really doesn’t do them justice. One pin is a bit of a mystery. It’s on the top left of the first picture and it’s to the lower left of the Glengarry badge in the second. If anyone knows anything about this (or any of the other pins) let me know! Neat game. You nailed the time period. Maybe contact the Canadian Heritage of Quebec http://www.hcq-chq.org/ or some other Quebec heritage body. It might make a nice museum piece. As you say, the one with what looks like a pick-axe and a hat with snakes (?) and leaves (flowers? insects?) is intriguing. Maybe take a pic of it separately query your readers or folks on Twitter. Those badges are beautiful.Thank you for rescing them.Would they have ended up in the landfill if you had not rescued them? I reckon so, they were in a black garbage bag so I doubt anyone would have found them otherwise! Besides being a great garbage treasure finder,you are also a wonderful writer.You write very stylishly and have good excellent research skills.Do also consider writing and photography as a career.So glad to stumble upon your blog. Just stumbled across your site, do you still have the curling pins?